Welcome to The Beat, a new TGE feature where our fave artists/bands/people give us tips on makeup! The most feature to ever me! Today we welcome Emily Kitchin. If you’re like me, you love scouring the internet for style inspiration. While I absolutely adore crazy colorful looks on other people, I often lean more towards natural, neutral tones for myself. It can be difficult to translate my eclectic style inspirations into beats that work with my lifestyle, but after 23 years on this earth, I have finally found a simple routine that makes me feel cute and confident. I have really sensitive, dry, acne prone skin, which can sometimes feel like the combination from hell, especially when I want to experiment with new looks. As a result, I usually stick with brands that I know work well for my skin and slowly venture into new products when I’m feeling mischievous. You’ll probably notice I basically only use Neutrogena and NYX products, but hey drugstore brands ROCK! Finding a good toner that works for you is so essential to any skin care routine and helps keep your PH in check. This toner can be a little drying so I always follow it with moisturizer. The moisturizer I linked above has a really watery consistency and is unlike any others I’ve used before, but my skin absolutely loves it. If you’re someone with dry skin, I HIGHLY recommend it! It feels like my face is taking that first sip of cold water you get after seeing your favorite band live. After that, I do my eyes. I am team doing foundation last and that’s 100% because I always get eyeliner or mascara somewhere on my face when applying. I have oily lids, so if I don’t use some kind of primer my eyeliner will make its way to my crease by the end of the day. I like to apply a little bit of concealer and set it with a powder foundation. Eyeshadow would probably work just as well, but I rarely wear eyeshadow and these are products I always have laying around. The most important part of my routine is eyeliner, and I ALWAYS do a wing. I’ve only ever been a pen type of gal, I’ve never been able to apply gel liner- I’m not THAT talented, and if you are, I am extremely jealous. Felt tip pens are my best friend though because it is so so easy to get perfect lines. Right now, I have been using this NYX liner, however I find it does dry out rather quickly compared to other products I’ve used. Lastly, I curl my lashes with one of those funky contraptions and apply mascara. This Maybelline cat eye mascara is so amazing for length and rarely clumps. I’ve been using Maybelline mascara since I first started doing makeup, I feel like almost everyone started from that iconic pink and green tube. I’m always experimenting with different foundations. Right now, I’m using this NYX “Can’t Stop, Won’t Stop” full coverage formula I noticed at Walmart. I have really big pores and a lot of scarring from how bad my acne was when I was younger so I really mostly wear foundation to cover up those imperfections, and add concealer to any problem areas. I just pump a small amount on the top of my hand and dab some spots around my face using my finger. Then, I use a beauty blender to get it all on. I just recently got into cream contour and it’s been… an experience. 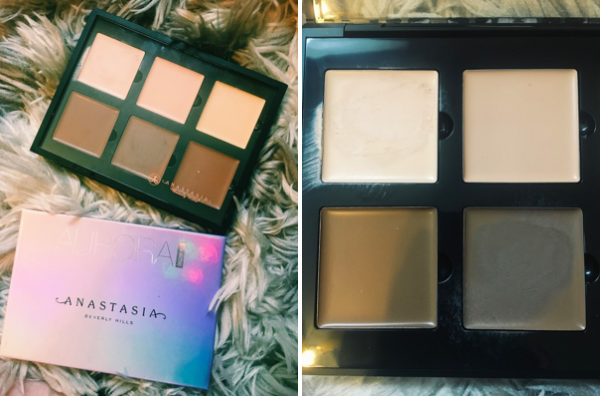 I saw these Anastasia palettes at TJ Maxx and had to try them out. I don’t really have any fancy brushes so I just swipe some on my cheek using my finger and then blend everything out with my beauty blender. Since I have dry skin I wanted to see if cream contour would make my face look less cakey than the powder contour I usually use. However, I have yet to really notice a difference. This color in the highlighting palette (Lyra) is perfect for the tip of my nose, and I absolutely love it. That’s the end of my makeup routine! It usually takes me about 10-20 minutes, depending on the morning I’m having, and will last me all day. If I could only live with one beauty product it would be dry shampoo, so I linked some of my absolute all time favorites. It took me a long time to join the Dr. Bronner’s hype train, but now I finally understand. This works especially well for cleaning my beauty blender after I finish my daily routine. Also is great for dry skin. PanOxyl is my holy grail face wash. I’ve been using it for years and it’s the only daily cleanser that keeps my acne from flaring up and stops new breakouts from forming too often. It can be very drying, but I really recommend it to anyone who has tried everything and still hasn’t found a solution for their acne. I often get asked how I keep my hair color so vibrant, what dye I used, e.t.c. I’ve been using Arctic Fox for years and I cannot recommend it more. It’s cruelty free, plant based, extremely vivid, inexpensive, and smells great. This is the only dye I’ve found that goes on the same color as you see in your mixing bowl, and doesn’t fade out super funky. On the same topic, I’ve been seeing Overtone ads all over my social media feeds and I’m here to tell you, they aren’t worth the hype or money. You can mix dye into cheap white conditioner to get the same effect with every wash, and not have to worry about your hair fading. I wish Arctic Fox would sponsor me already, I have a bottle of practically every color they’ve released. These wipes are basically the magic eraser of the makeup world. They get off ANYTHING with very little effort, they are also super fresh and nice on the skin so you don’t have to worry about breakouts.